At some point, we can all hit that snag in life where we feel just like a zombie, doing the same things day-in, day-out, things that are expected of us and needed for survival, but not so much things for ourselves. 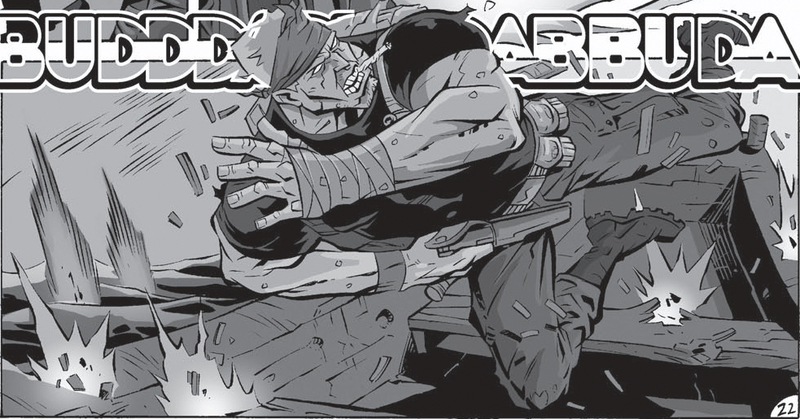 Marlow is an ex-marine placed into that position to an extreme. The corporation he works for has infected him with a nano-virus, in the hopes of turning him into a zombie they can use to commit atrocities, forever dangling their cure like a carrot in front of his face. 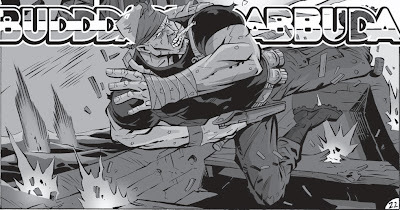 What they don't count on is that Marlow is more than just a grunt and the virus still leaves his moral compass turned on, pointing him in another direction entirely. 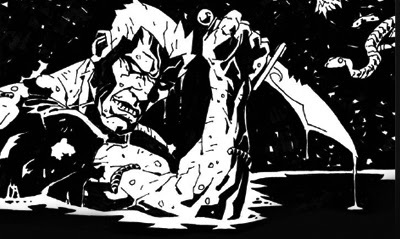 As the two paths begin to collide in Marlow, a graphic novel from Arcana collecting the one-shot Marlow: Soul of Darkness and the new River of Symbols storyarc, it's anyone's guess as to which way the mercenary made "monster" will emerge from the crossroads at hand. Having been graciously forwarded an advance copy by writer Aaron Thomas Nelson myself, I have seen the answer, and can say you are going to enjoy the ride that leads you there as much as I did. 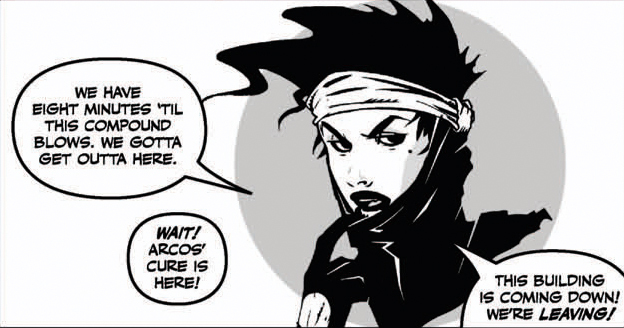 In Soul of Darkness, Marlow assembles a team to find and remove Dr Acros from his new zombie infested home. After being driven mad by the killing of children in the Sudan, Acros now seeks to gift his zombie virus to the world. For if he can remove life and death, religion loses its hold by promise of heaven and hell, and without religion, war looses it's motivations. Just one of the layers Aaron provides to the story, it is one of those great Ra's Al Ghul type scenarios, where he's wrong but he's right, and any survivors of Marlow's team will be forever changed because of it. In River of Symbols, Marlow has found solace in Burma, where a local fruit keeps his virus at bay. In return he helps keep the villagers safe, but the corporation he worked for has its fingers in every location and as his virus grips hold, they soon cast their shadow over the land he now calls home. Marlow's only salvation? The love he still has for his estranged daughter and their hope of being reunited. For me the unsung highlight of this book are the locations. Having a mercenary book (or any book for that matter) that hops the globe and explores other peoples beliefs and cultures makes for a refreshing change from downtown Manhattan. Should more adventures follow, I can only hope the future locations are just as vibrant. Speaking of vibrant, Soul of Darkness is brought to life by Mathew Reynolds pulp-tastic silhouette styled art and L Jamal Walton's clean clear lettering. In River of Symbols, Dario Carrasco Jr's amazing line-work steers the boat towards a brighter art style, one that reminds me of the magic of both Doug Mahnke and Jeff Smith at the same time. 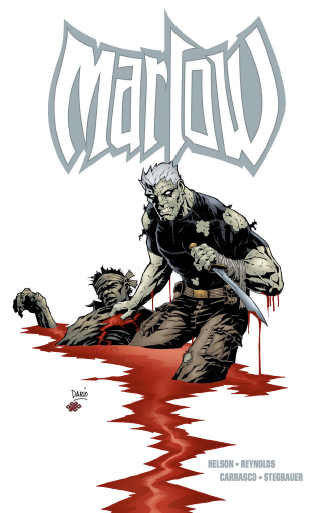 Marlow is released late February from Arcana Studios, and is currently available for preorder here through Amazon.com, as well as no doubt your friendly neighbourhood Previews ordering comic book store. If you are after a zombie story that doesn't just run on autopilot, but has a strong heart and a thought-provoking core, then I recommend you fork out for Marlow, the man who is exactly that.